is in charge of indoor boy messengers q.v. 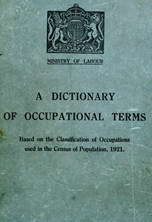 ; allocates duties, maintains discipline, and is responsible to head messenger (751) q.v. assists head of technical section in a museum, gallery, etc., by cleaning and shifting exhibits, keeping records of permanent and loan exhibits specimens, etc., distributing files, letters, etc., and running messages; usually supervised by a senior attendant called chief attendant. assists baker's vanman or barrowman (776) q.v. on his rounds by delivering loaves at customers' houses or by taking charge of horse and van while baker's vanman interviews householder; acts as errand boy q.v. carries pouches containing bills of exchange, banker s drafts, cheques for clearance, etc., between own and other banks in area, and communications between head office and suburban branches of own bank; carries bullion and boxes containing customers' valuables or securities to and from safes in strong room; loads and unloads bullion into and from taxi-cab or other vehicle, and accompanies clerk in charge of bullion on journey in vehicle; in small branch banks, sometimes lights and attends to office fires or heating apparatus, etc. ; sometimes also acts as resident caretaker (921) q.v. and is responsible for cleaning of bank. (ii) an errand boy or shop boy q.v. delivering goods with help of hand barrow. receives from bookseller (770) q.v., list of books not in stock, ordered by customers, and goes round to publishers to obtain them; usually delivers books which are however, sometimes fetched by collector's boy q.v. ; pays publishers for books, in cash, at trade prices, unless employer had running account with publisher; cf. book publisher's collector (942). delivers books from a circulating library to private houses; usually rides tricycle carrier. posts letters, despatches telegrams, delivers messages and light parcels, cleans and fills inkpots and does similar odd jobs in banks, insurance offices, business houses, etc. (ii) a messenger q.v. working inside G.P.O. a milk boy q.v. who helps bungey man (776) q.v. in delivering milk from milk float. assists book collector q.v. by fetching, from publishers, usually in a cycle carrier, parcels of books which are (too heavy to be carried by hand; is usually employed part time on other duties, e.g. packing parcels of books, delivering parcels of books to customers. a boy messenger q.v. employed by colliery company. usually a member of the Corps of Commissionaires employed to undertake messenger work of considerable responsibility, e.g. bank messenger q.v. will also attend at entrance of hotels, theatres, cinemas, banks, insurance offices, business houses, etc., to direct and assist enquirers, keep out undesirable persons, etc. ; cf. attendant, cinema, theatre (889), door attendant (917). a member of the Corps of Commissionaires engaged by G.P.O. to deliver telegrams during night. delivers messages, letters, fetches and delivers parcels, makes purchases on behalf of customers, pilots them to required places, stands in theatre queues, and performs services of a varied character; is attached to District Messenger and Theatre Ticket Co. Ltd., who lend his services, according to a specified scale of charges, to the public. delivers medicines, prescriptions, etc., to patients' houses; frequently acts, in addition, as page boy (900) q.v. at surgery. (ii) runner, small runner, trotter; takes messages, fetches and carries tools, materials, refreshments, etc., for employees in factories and workshops, from one room or department to another; sometimes specifically designated, e.g. cycle errand boy. as for errand boy, but usually delivers goods on foot only; in clothing trades, is sometimes employed as matcher (429) q.v. performs minor duties, such as carrying forms and papers, etc., in headquarter departments of Post Office; attends compulsory classes to qualify by examination for higher appointments. carries documents (policies, deeds, mortgages, etc.,) from own insurance office to other insurance offices, or to banks, etc., or from head office to district offices, or vice versa, and performs other duties of messenger q.v. ; sometimes also acts as resident caretaker (921) q.v. and is responsible for cleaning and heating of office. (ii) in some clothing trades, sometimes does work of matcher (429); sometimes specifically designated, e.g. dock messenger. assists milk deliverer (776) q.v. on his rounds or himself acts as deliverer; collects empty bottles and cans from customers' houses; in intervals between rounds, assists at depot in washing bottles, cans and churns. (ii) a bank messenger q.v., or other messenger, employed on night duty as night watchman (963) q.v. patrolling premises, attending to telephone, etc. a civilian employed as messenger q.v. in a military office. fetches beer for workmen on buildings, works of construction, etc. ; boils up water for tea, etc. acts as messenger q.v. to commercial traveller (773) and usually also carries samples; cf. bagman (759). a messenger q.v., usually a girl, waiting on showroom assistants (775) q.v. in drapery, millinery, etc., establishments. as for telegraph messenger, delivering cablegrams received by cable company. errand girl q.v. carrying material and finished garments between tailoring workshop and wholesale or retail bespoke tailors. delivers telegrams, and takes back reply (if any); attends compulsory classes to qualify by examination for higher appointments. takes written messages, and other documents from tube attendant (769) q.v. to destination in works or large offices; sometimes also does work of tube attendant (769). a messenger q.v. who delivers telegrams and other communications to members on floor of Stock Exchange; sometimes also acts as doorkeeper (917) q.v. ; waters floor periodically with watering can to lay dust; after closing of Exchange, sweeps up litter from floor and puts it in bins for removal.